I played me part, see? For me country when it needed me. And I loved him, and he loved me. And I knew he knew, and that was enough. But I only felt alive when I was scrapping with Bluto. If I'd said "encyclopedia" or "electricity"? A clown even when I wasn't being funny. So I went along with it. What choice did I have? My passing was a mistake, a bid for attention that went wrong. You should have found me in that "frigidater." Couldn't you follow the dotted line? Then a clash of cacophanous bells. Are what the Bad Humor Man sells. He yells, "All you brats quit that shouting!" And he smacks any kiddie who sings. Are what the Bad Humor man brings. And he sneers that all children are crooks. When they catch his bad-humored looks. And a garnish of saccharine pills. And he takes nothing smaller than dimes. When you hear the Bad Humor Man's chimes. "Daddy" made me feel loved and welcome. A proof of her virtue. She was soon gone. And Sandy. Always loyal, wonderful Sandy. And his own financial interests as well. A setting of peril for me without any hope of profit for him. Crying helplessly at the cold white eye of the moon. Which looked too large for such a small dog. Making phone calls and operating a computer. And tried to lose him on a lonely road. Gently, the front bumper just touching a pine tree. That in a way, it really was dog-gone funny. To all the good things in life. Went back to the pool, then painted some more. And I even forgot to brush my teeth some times. And things went bad from there, and I perished. Before you prime your canvas. I trembled between them. There was no escape. Then I saw the recruiter's door. I stepped inside. With my porkpie hat gone and an army cap in its place. For the permanent evasion of responsibility. And that all of us were already in our private hell. And kept going on my ways. You taught me something, Toby. And bus stations and personal ads. Out of my system for good. And learned quickly what that entailed. Whether the world wanted it or not. Before the credulous public as a menace. And stayed at home most days, watching TV? A cardboard carton for my eternal rest. Phone calls, headlines, music, or games. And played board games with my bored kids. And couldn't puzzle out the medicine cap in time. And Wall Street is sunk. Cheer up! Cheer up! Cheeeeer up! Let's hang the fathead to a tree! The world's in the red. And all the while they tell us to smile. That's where it started. They sold the little record players at Linder's, where I'd go look at toys and novelties (fake barf! whoopie cushions!). I lusted for that little player, and dreamed of having one. 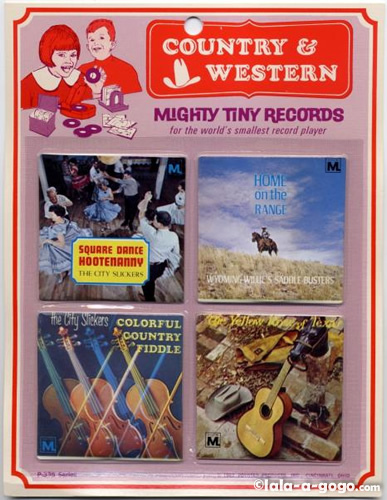 I must have been in second grade at the time, and I wished I could have a record player that I could take everywhere and have little tiny records to hear on it. 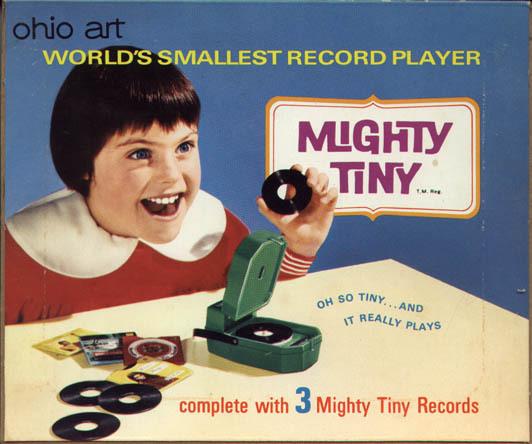 Never mind that the records they sold for that player probably sounded about like the plastic disk inside the Susy Moppet doll a friend found for me (that's another story). Never mind that they were recorded by utter nonentities who probably made Susy Moppet sound like Barbra Streisand. I never heard one of them played, and was probably happier that way. Years passed. In junior high, I got my own tape recorder. A year after lusting for the 1.5" reel machine a friend had, I had saved up and got a 3" reel recorder at Penney's and proceeded to tape everything. I kept using it up to the time I was buying my first Firesign Theater albums, and then I finally gave in and got a cassette recorder, which I lugged around in a briefcase with as many tapes as I could cram in there. One day, years later, I thought about how much my Walkman-type player resembled the wondrous record player of my far-off dreams. When I replaced that with a CD-based mp3 player, the thought came again. Now I think about it as I pat the shirt pocket with the 120GB iPod. I also wished I could fly. Still waiting.